Over 10 feet of solid grease packed the sewer line of a Long Island NY apartment complex. Raw sewage surged into the parking lot. Health authorities threatened action. And frantic facility managers sought fast action. 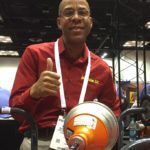 That’s when they called Keith Johnson – and his “big artillery”. 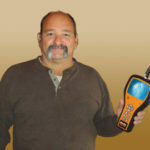 Owner of Accurate Cesspool and a professional drain cleaner for over 25 years, Johnson forged a local reputation for swiftly and professionally tackling the area’s toughest jobs. Years of accumulated grease, sediment and debris had accumulated in a back pitch part of the 8″ pipe. Failure to employ routine, precautionary line cleaning had simply compounded the problem. So Johnson brought his JM-2512 Typhoon™ trailer jet from General Pipe Cleaners. With a 2500 psi, 12 gpm pump for high water flow, General’s Typhoon blasts big lines and long runs clean of clogs. Its powerful 24 hp Honda engine with 10 gallon fuel tank ensures extended performance on stubborn stoppages. And its 200 gallon holding tank carries enough water to handle remote applications with limited water access. Johnson uses the Typhoon™ for a wide variety of jobs. 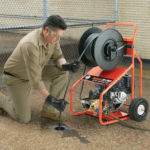 Two hose reels – a jet hose reel with 400 ft x 1/2″ capacity featuring electric rewind, and a water supply hose reel carrying 150 ft x 3/4″ hose – mount at the rear of the unit by the pressure gauge and output valve. Engine controls and hour meter are positioned within easy reach in the lockable tool box with slide action doors below the reels. 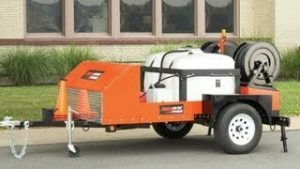 The Typhoon boasts electric brakes, safety strobe light, three safety cones with holder, rear fold-down stabilizer jacks, retractable hose guide arm, and antifreeze system as standard equipment. General’s Typhoon also rides on rugged 15″ radial tires with modular wheels and leaf-spring suspension rated at 3500 lbs per axle. A front splash guard helps shield the pump and engine from road debris. And the jet’s tough epoxy finish ensures added weather protection. For more information about the Typhoon trailer jet, visit www.drainbrain.com/jetset or contact the Drain Brains at General Pipe Cleaners at 800-245-6200 or 412-771-6300.